This entry was posted on Wednesday, August 10th, 2011 at 15:15 and is filed under Business, Economics, Politics. Is it possible that the United States is immune to this sort of violence? As the world economy teeters on the brink of utter collapse, with Europe on the leading edge, its failed welfare states going bankrupt in an effort to put good money after bad, it’s a sobering reminder of what can happen when politicians are allowed to trade their citizens’ wealth for the votes of other citizens exempt from the tax collector’s grasp. As the welfare state in our own country has begun to grow out of all previous bounds, it’s important to examine our own vulnerabilities to this sort of change. Our own economy is again on the ropes, largely due to the increasing burden of the welfare state upon the wealth producers in our nation. This sort of devolution sets up a feedback loop that tends to guarantee a worsening of economic results, which will in its turn undoubtedly spawn more civil and social unrest. 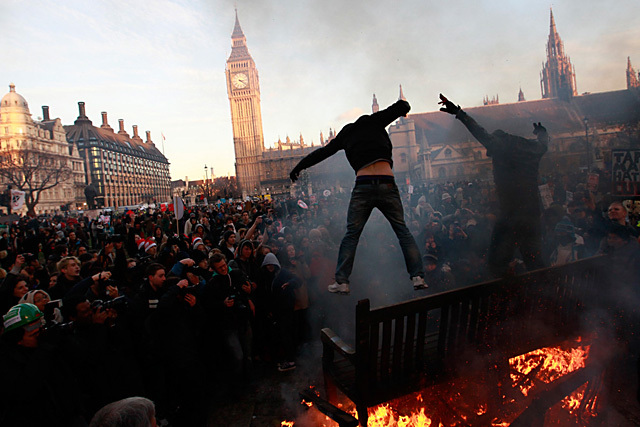 Of course, we’ve been through economic hardships before, notably the Great Depression of the 1930s, but never have we seen a confluence of events combined with the sort of outright radicalism we’re now watching on the streets of London. 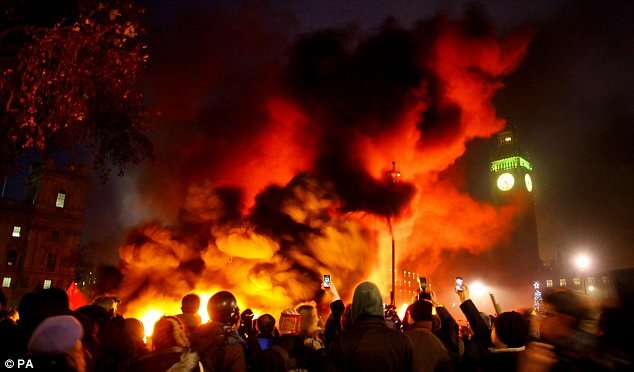 In the US, we have had a number of riots, famously in the era of the great struggle for civil rights for African-Americans, but we’ve not seen a potential tinderbox growing like this since the days immediately on either side of our own civil war. Before we dismiss this threat out of hand, let’s examine what’s driving it, and how it aims to attack our exposed flanks. One thing that can be said without any controversy is that the riots erupting in Europe have a distinctly socialist, or at least anti-capitalist flavor. While the anarchists involved seem to hate everything except the hand-outs they receive from government, it is clear that these are ultimately the children of the entrenched and growing welfare state. It is in such movements that great tragedies have been birthed throughout human history, and they nearly always blossom from the same deadly seed: These are predominately young people who have been educated by the welfare state to expect to have all their wants and desires met by the welfare state, as though it had been a perpetual parent, and they could remain indefinitely as spoiled children returning endlessly to the nest in which they were raised. What of our own country? Are we vulnerable to this same phenomenon here at home? Ask yourself if we have created a similar welfare state, with a similarly bankrupt public education system in which children are passed through, without much effort, being spoon-fed a steady diet of propaganda based on a litany of leftist causes that teach the students to expect to be provided their every need or even desire without much effort. Consider our own welfare system that now provides free food, rent, housing, medical treatment, education, birth control, automobiles, utilities assistance, cable TV, internet, and more recently, cellular phone minutes. What exactly is it that anybody would go to work to get? This creates an entitlement mindset that forms into a slavish army of drones who will eventually rise up and destroy the people who so generously subsidized their existence. You might wonder what would lead people who’ve been handed every material necessity to bite the hand that feeds it, but if you know the intellectually frail sort of mind that willingly subsists in this way, you ought to know that there is no necessary linkage between cause and effect in their thinking or in the formulation of their desires and demands. As the economy worsens, there will be fewer jobs and therefore fewer opportunities upon which to build a work ethic and a healthy respect for private property or the laws that serve to protect it. What all of this has created is a generation of savages, whose first reflex is to loot, pillage and plunder. Don’t wonder who has created this growing army of brigands and thugs. You have. Your labor and your taxes has been taken to support the birth, growth, and moral depravity of an army that will be turned against you. All of this makes clear the endless fallacies of the leftists’ welfare state. One cannot print prosperity. One cannot inflate it on the back of the efforts of a few. One cannot redistribute it, and one cannot nurture into existence those who would create it by teaching the young that they deserve anything they want irrespective of what they have earned. In the same way that we have collectively indoctrinated our young with a false self-esteem over the last two decades, so too have we indoctrinated them with the notion that they are owed all the prosperity they see in the wealth of others. We’ve made the dangerous error of neglecting to explain to them that such prosperity is the product of hard work and thorough preparation with a necessarily diligent attitude toward one’s life and prospects. In short, we have created an army of people who aren’t merely amoral, as some have suggested, but instead thoroughly immoral, who see the world through the cracked and skewed lenses of their own immediate, range-of-the-moment self interests, without respect to their long-term well-being. “What pleases me right now?” This is the standard of their moral belief. They have no reliance on any religion excepting only a belief in the myth of their own entitlement. If we permit them to go further, we are signing our own death warrants, as there will certainly come the day when they no longer see our value even as those who provide their loot. In a hopeful moment, the Mayor of Philadelphia, Michael Nutter, admonished particularly the black youth in his own city who have been igniting their own first embers of a similar fire with the new phenomenon of flash-mobs and the mob violence they have been increasingly spawning. There will be those who view this as no big deal, and a problem without wider implications because we’ve seen riots in our large urban centers before, but any who would dismiss this as more of the same are making a grave error. This isn’t a problem confined to urban or African-American areas, but instead a strong tide running through the core of most of the country’s young. This is a widening of the war against capitalism, and these mobs are the first foot-soldiers. Make no mistake about it: We are facing a global catastrophe unlike any in our history since at least the civil war, and if we don’t stand to oppose it, we’ll become its victims. Some of you will be crushed to find that the young people you’ve raised, under your own roof, and of your own flesh and blood may be in the process of joining this wave. These are the opening shots in a war to determine the course of the world’s future, and it’s time for the real adults among us to begin confronting this now, on the front end, before we inherit a true disaster in violence on the back end. Our time is running short. 4 Responses to Coming to America? I'll be honest, I'm kind of hoping if the riots do come to US they hit my city of Phoenix first. The advantages to this would that A. downtown need a major face-lift and rioting would be the impetus do just that B. after two hours of rioting all the rioters would drop dead from heat stroke in this weather C. The massive legions of dead rioters might dissuade the rest of the idiots in the US from trying it anywhere else. It's overly optimistic, and I fear you are right that this war against capitalism and freedom will only get worse. Here are the problems with that: 1. It will be used as an excuse to seize firearms 2. It won't likely be so lop-sided 3. Leaders from other countries will be screaming the UN has a "Responsibility To Protect" (R2P). The people who are fomenting this sort of unrest know what they're doing. They're attack our soft underbelly and they're using our own compassion to build the army to attack us. We must disassemble the welfare state. This was so well put. I find myself perusing the Scriptures more given the present climate of unrest, turmoil, men's love growing colder towards one another. Jesus own words said that "there will be a time of great tribulation, a time the world has not known, nor ever shall know again." I can't help but think we are the generation who will see the dismantaling and then collapse of all things good. I think that deep down we ultimately know there is nothing to stop the continuing fall of the dominoes. Good people will not be able to change our culture politically or socially because "evil men will go from bad to worse" and way too many of them are already in positions of power , influence and making the laws which ultimately benefit themselves. We are the generation who are hearing the shrill scream of "the reaping and sowing" principle and smelling the rotten fruit it has produced. We have failed God by putting our trust in man and look where it has taken us. I pray the Lord's mercy upon the people I love for the rest of our country is lost and asleep. The first paragraph of your article has the answer to the question; Why is this all happening? "As the world economy teeters on the brink of utter collapse, with Europe on the leading edge" the world teeters because the teets on the utter are dry. The redistribution of wealth is coming to an end. Yes, there are plenty of wealthy people in the world, but they care less and less about the poor and the government does not have the power (luckily) to take all of the money the wealthy have. As governments realize they just can't continue the current welfare system, paying for trillions of dollars for housing (subsidies), food (food stamps), child welfare (ADC), and other giveaways intended to "help" the poor, the teet goes dry and the utter stops producing. The poor want more, not less, so they riot, killing the cow that provided the saving milk. I just don't know what can be done. It will take the second coming of the Lord to figure it all out.